Since I didn’t cover any specific highlights of my trip, I thought I’d share my favorite highlights of my 3 week EuroTrip. Eiffel Tower – watch from below at night and see the Eiffel Tower lit up and twinkle. It’s beautiful at night! In the daytime, make sure to go all the way up to the top to see all of Paris. If you can prebook your trip up, that would be the fastest otherwise be prepared for super long lineups. Bonne Journee, a subway boulangerie/sandwich/bakery shop that had delicious Pain au chocolat nicoise (Chocolate croissant shaped like a square and filled with nutella). Delicious! St. Michel Metro station – the small streets near this area close to Notre Dame Cathedral is filled with restaurants and small bakeries, donair shops, panini and crepe shops. We ate delicious and cheap panini from a small shop selling fresh made crepes and paninis. Pierre Herme macarons – they make them so soft and melts in your mouth. YUM! Love the different unique flavors such as INFINIMENT JASMIN (Jasmine Flower with Jasmine Tea), ARABESQUE (Apricot & Pistachio), and INFINIMENT CARAMEL (salted butter caramel). Sailing down the Seine River at night to watch the city lights glitter by. Disneyland Paris had some differences in shows and rides than California or Orlando’s Disneys. I really enjoyed Space Mountain: Mission 2 (warning, it might be a bit sore on the neck at first so maybe just ride once to start)), and it’s Tower of Terror seemed scarier but more fun! Their night show was also really neat to watch as they did projections right onto the castle. La Vallee Village outlet shopping – 150 euros for a leather Longchamp bag was an awesome deal! Bodum also had some affordable tea kettles and coffee presses, but I didn’t have enough luggage space for that. If you are at the outlets, make sure to stop off at Val D’Europe shopping centre and go to Auchan supermarket to stock up on French food souvenirs! They also carry cheap luggage in case you need a spare one to ship all your goodies back home. At Val D’Europe, they have a chain restaurant specializing in steak called Hippopotamus that was delicious, great deal, and unlimited sides! After dinner at Hippopotamus, we finished with delicious salted caramel and Belgium chocolate swirled soft serve ice cream at Jeff de Bruges, a French chocolatier located inside the mall. 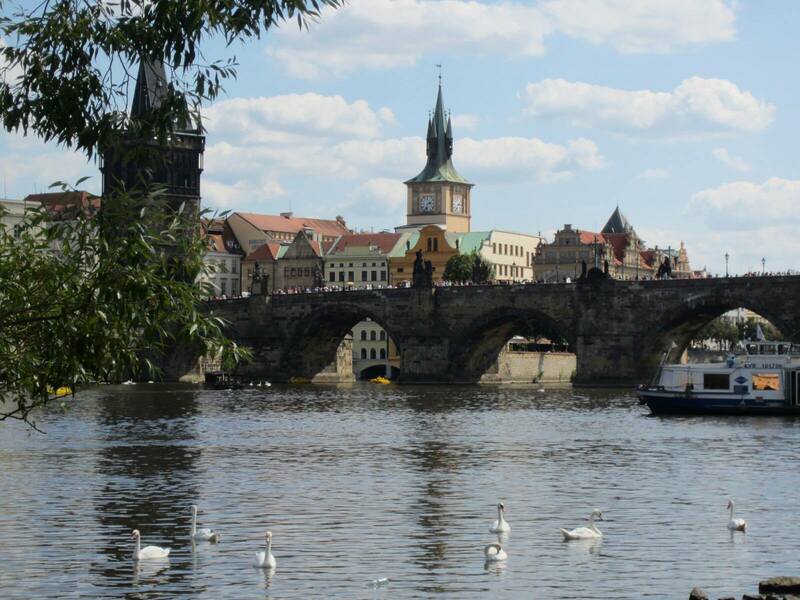 Segway Tour – Make sure to do a Segway Tour of Prague so you can see more things without killing your legs. We found it a good deal and had lots of fun. Cheap beer! Pilsner is made in Prague, but their local beers are also really good. I especially loved the fruit beers such as Bernard’s Apple Beer. You can find cheaper beers at the large supermarkets outside the Old Town or Lesser Town. Ate Trdelnik with nutella – it’s a dough cake baked and crunchy, rolled out and sprinkled with cinnamon, nuts, and sugar. Optional with nutella, but have it with nutella! It’s delicious! Prague Castle‘s St. Vitus Cathedral is a must see! The architecture is gothic and put me at awe. Plus visit the Golden Lane inside Prague Castle to check out the medieval knight and weapontry exhibit, along with the little souvenir shops with locally made gifts. I particularly liked the locally made leather bookmarker straps I found in one of the shops! Eat a pork knuckle – it was huge and delicious – my hubby really enjoyed it. Goes well with beer. All the little shops were great for shopping. Try to find your leather here if you aren’t going to Florence, as the deals are better and more selection than in Rome! I found loafers for 29 euro but didn’t have my size so I didn’t end up getting them. Venetian masks – every other vendor and shop were selling these masks, however even if they are cheap, make sure to see whether they have the stamp saying they were made in Venice. Most that don’t have the stamps are made in China! I found a small shop selling all made in Venice masks and the prices ranged from $1.99 to $100 depending on the style and quality. 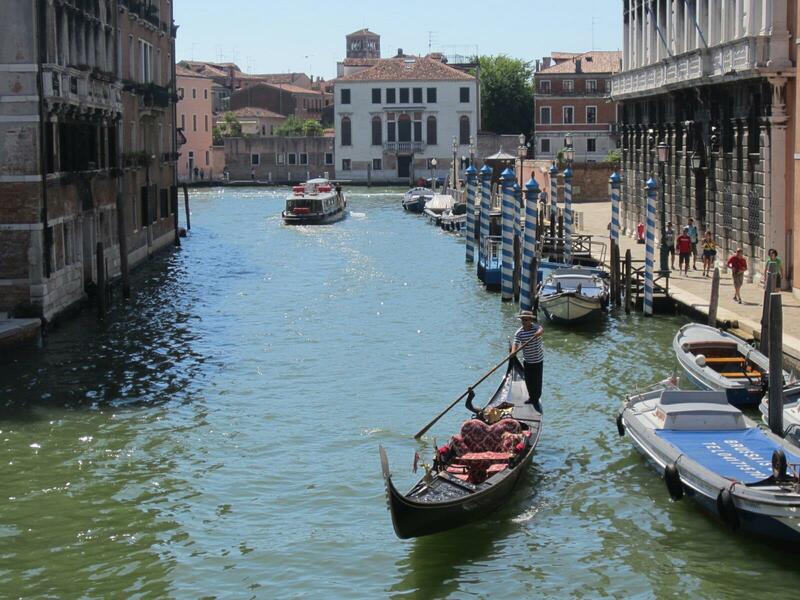 Watching the gondolas pass by with singers and accordions. It’s amore! Watching the sunset leaving St. Mark’s Square by ferry bus is quite gorgeous and romantic. The Vatican’s Sistine Chapel is quite amazing. Too bad no photos. Didn’t like all the souvenir stands inside the Vatican though. Made it too commercial. 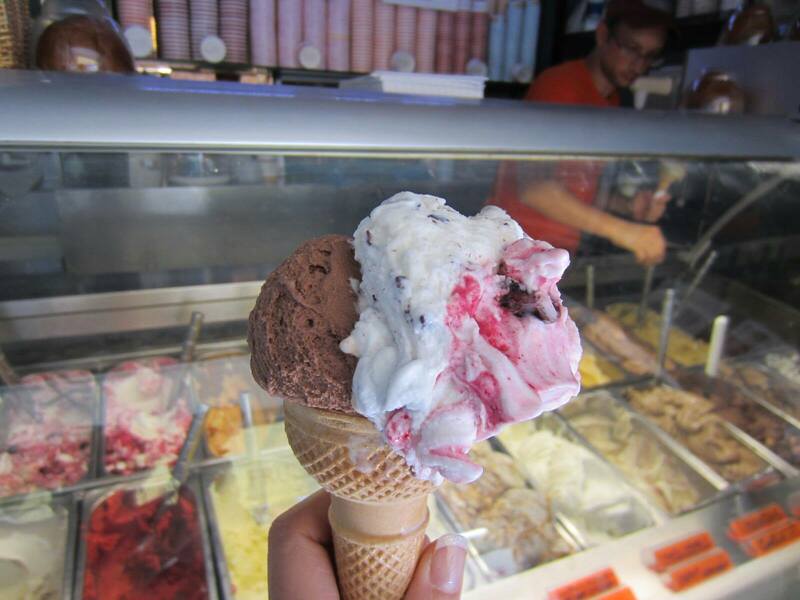 Gelato at Old Bridge near Vatican – cheap! $1.80 for 3 scoops. Best deal we found in Italy. Best gelato we had was the watermelon gelato at Gelateria Vice, a gelato shop near Insalata Ricca near the Parthenon. Alice’s Pizza near the Vatican – pizza by the slice by weight, but the crust was super crunchy and thin. It was delicious and cheap! Shopping for leather shoes – Rome is the main city in Italy to look for cheap leather shoes made in Italy. While we were there, since it was end of summer, lots of sales on sandals and summer shoes that were cheap! $10 euro for Made in Italy leather ballet flats. Colosseum’s guided tour is worth it to book, since the tour guides are really good, even comical, and informational. Plus they show you the best views of the inside of the Colosseum. If you didn’t order tickets online, buy them at either Palatino Hill or the Roman Forums. The lineups are less than at the Colosseum. Delicious homemade seafood pasta at Insalata Ricca, a Rome chain of pasta restaurants. We had a really tasty Gnocchi and clams, and their spaghetti with clams and mussels was a great deal. Seeing the parade of the winning neighborhood for their Palio horserace was the highlight of this visit. We missed the horserace, but got to see some festivities. Walking around this walled city that felt like a medieval fortress brings me back to the medieval era. San Lorenzo market is the place to go to buy leather goods. Make sure to look at a lot of stands and negotiate. We bought our leather goods, scarfs, pashminas here but never paid full price. Statue of David inside the Galleria dell’Accademia – even though there is a copy outside the Uffizi museum square, the actual one inside the Academia is worth seeing, in all its glory standing in the opening with the sun shining through the skylight. The Duomo is beautiful to see daytime or night time. We stayed right near it so we had a beautiful view of it from our room. However the downside is that the bells will ring every hour and would wake us up in the mornings. 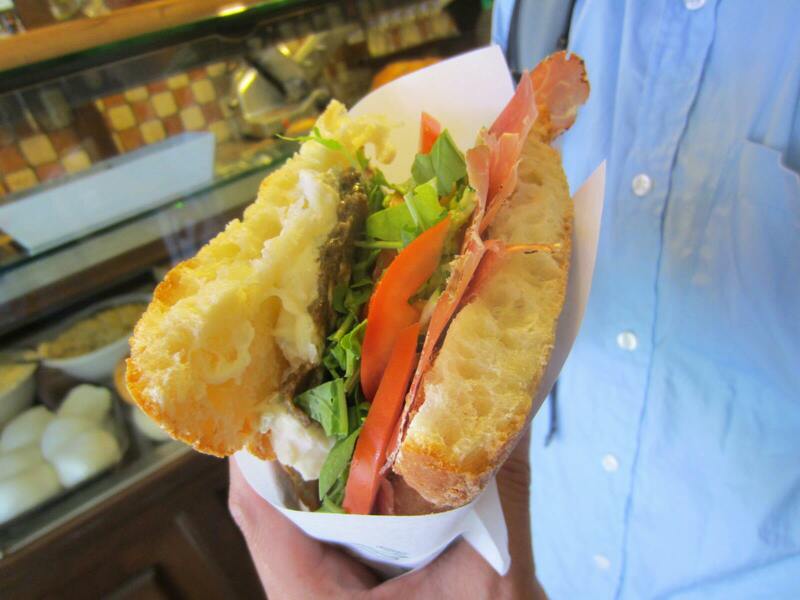 Delicious gelato and sandwiches on Via dei Neri, a street near Uffizi. Large foccacia sandwiches from All’Antico Vinaio were loaded with ingredients such as smoked wild boar and black truffles. This was number one on Tripadvisor and now we know why! Staying at Hotel Villa Argentina on top of the hill of Riomaggiore, the first town we visited of the “5 Lands” provided us with a terrace with a beautiful view of the town and the Italian coast! Definitely a change from the cityscape. 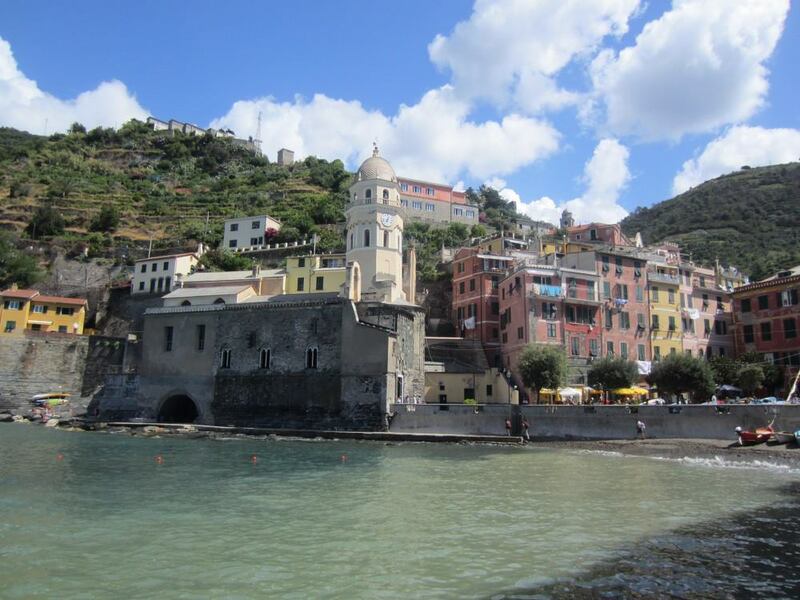 Vernazza and Monterosso were the two towns we really enjoyed the scenic seaside beaches and harbours. The water was warm and we saw lots of people swimming despite the large waves coming crashing into the boulders on the shoreline. Eating fried calamari out of paper cones for dinner, and enjoying some tasty gelato while watching the sunset over the cliffs and the sea. We were glad to have booked a half day bus tour to Eze and Monte Carlo/Monaco to save us from driving and getting lost, as well as saving our feet from public tranportation. The tour picked us up and dropped us off from our hotel. We really enjoyed our guide, Tony, who also showed us some sites of Nice that we would pass and also where Elton John’s house was on top of a hill in Nice! Eze is a really neat medieval village perched on top of a cliff enroute to Monaco. I enjoyed venturing through this village of shops and restaurants to see the sights from the top. 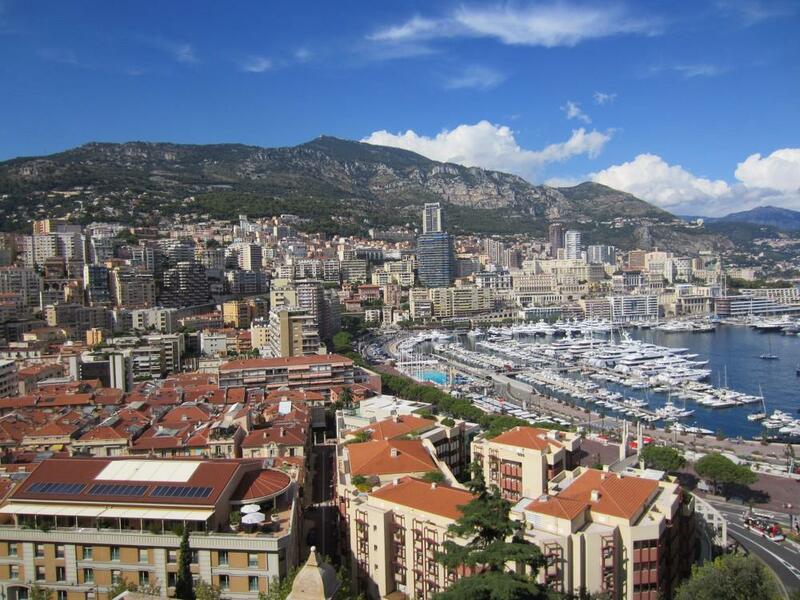 Monaco, and even the towns we passed from there back to Nice, seeing all the rich toys – fancy cars, lots of giant yachts, and jets! A rich person’s paradise. Tried rabbit and duck confit at our hotel restaurant – surprisingly quite tasty and the price was reasonable. 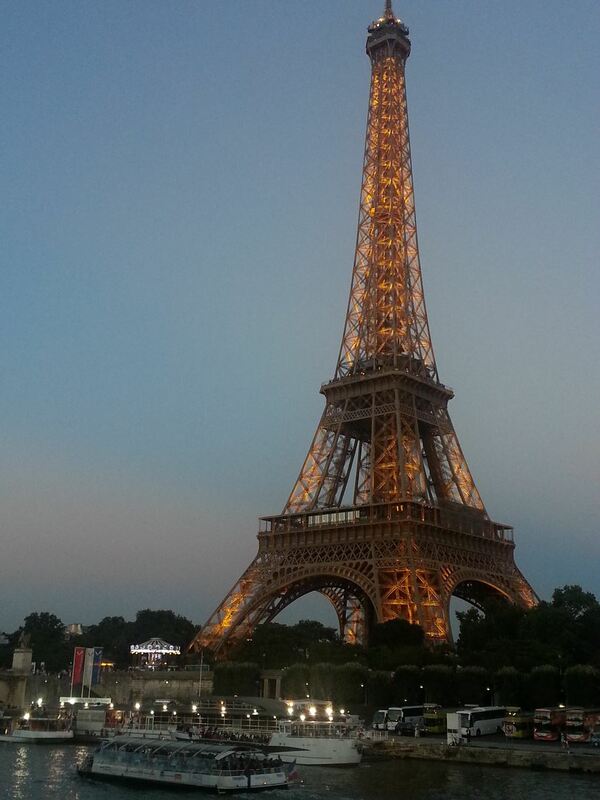 My trip started and ended in Paris, although my favourite is definitely Prague! I hope you enjoy these highlights from my EuroTrip as much as I did!